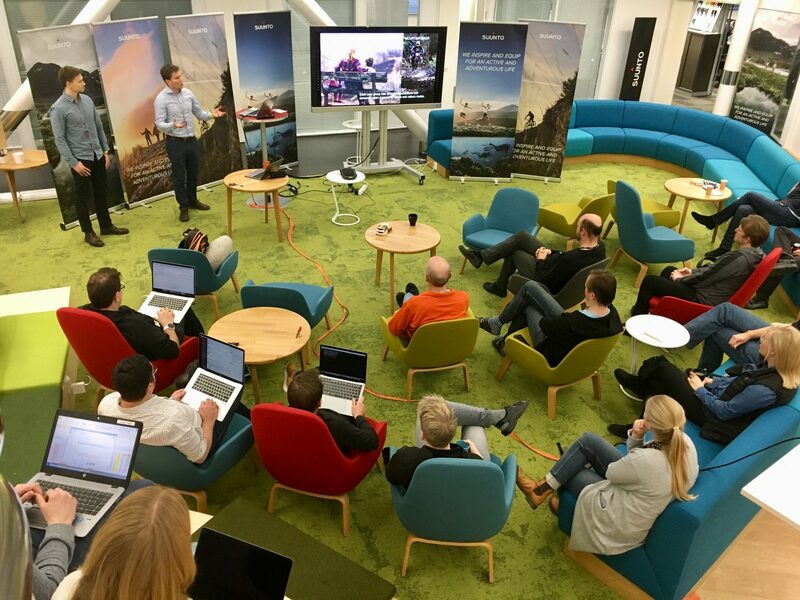 Team TerrainSense, one of the winners of Movesense Challenge awards at Junction, visited Suunto to present their solution of automatic mapping of the difficulty rating of mountain bike trails with Movesense sensors. Have a look at their presentation here. During the 40-hour hackathon, the team was able to build a working prototype system that measured terrain data with a Movesense sensor attached to a bike near the rear hub, an Android mobile app that collected the data and had a UI to the rider to mark unridable parts on trails, and a map server that showed the collected data with a heatmap style difficulty rating. The map server has some simulated data to demonstrate the functionality and how user can select trails with a suitable grade for his or her own riding style. The team is now investigating opportunities to develop their system further. The next stop is with Helsinki City, to demonstrate how the same solution in city bikes could be used to collect important street surface quality information for maintenance purposes. Congrats to the team once more! We believe there is a lot of potential here and will also think about how to make it available to Suunto users.